Iraq’s security turnaround has continued through the winter. 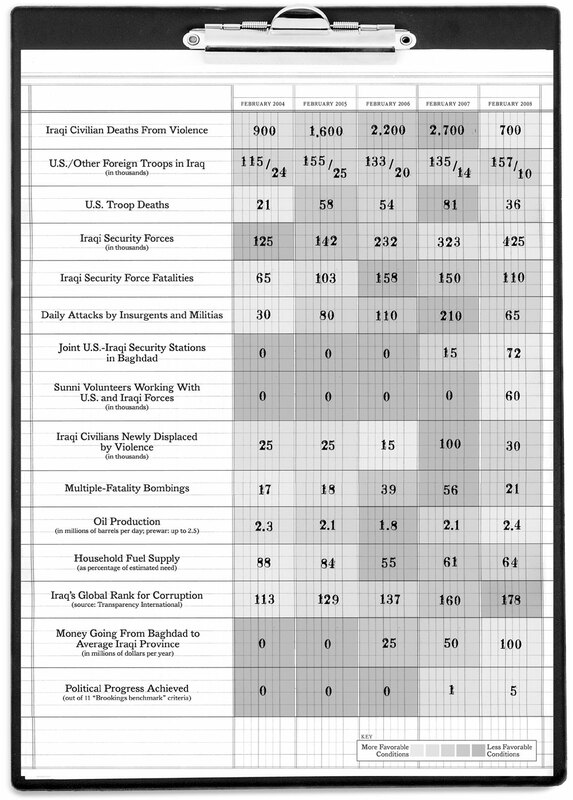 The question for 2008 is whether Iraqi security forces can preserve and build on this improvement as they increasingly bear more of the responsibility as the number of American troops declines (and as refugees and internally displaced Iraqis try to return to their homes). Iraq’s economy is propped up by oil. Attacks against oil fields and production plants are dropping fast (down to one a month this year, after averaging 5 to 10 a month previously), allowing modest increases in output. Still, basic health and education indicators, as well as sewage and water and irrigation services, show little improvement, and unemployment is high. The most intriguing area of late is the sphere of politics. To track progress, we have established our benchmarks* — a set of goals on the political front similar to the broader benchmarks set for Baghdad by Congress last year. Our 11 benchmarks include establishing provincial election laws, reaching an oil-revenue sharing accord, enacting pension and amnesty laws, passing annual federal budgets, hiring Sunni volunteers into the security forces, holding a fair referendum on the disputed northern oil city of Kirkuk, and purging extremists from government ministries and security forces. At the moment, we give the Iraqis a score of 5 out of 11 (our system allows a score of 0, 0.5, or 1 for each category, and is dynamic, meaning we can subtract points for backsliding). It is far too soon to predict that Iraq is headed for stability or sectarian reconciliation. But it is also clear that those who assert that its politics are totally broken have not kept up with the news. *On a scale of 0 to 1 for each category, we accord a 1 for the pensions law, and for the 2008 budget. We then estimate half points for six categories: passing of the reformed de-Baathification law (which may or may not work out as well as intended in the actual implementation), purging extremists from the government (which is going fairly well but largely at U.S. insistence and cajoling), hiring Sons of Iraq into the security forces (again, going well, but there is some interest from the Shia-led government in limiting the number of Sons of Iraq who can join security forces as opposed to gaining other types of government jobs), passing of the amnesty law (again, the law is promising, but implementation is key), central government sharing of money with the provinces (far better than before, but still needing to progress further), and passing of the provincial powers act (recently passed, but also recently vetoed, leaving it in some limbo). We accord the Iraqis 0 for resolving Kirkuk, for creating a permanent hydrocarbons law, and for passing a provincial election law. This version is slightly modified from the original which appeared in the New York Times.